Our fall 2018 poinsettia sale, our 30th annual sale, is now underway. We are offering plants in two sizes (6.5″ & 8″) and three colors (red, white & pink). Money earned from this sale will support a number of service projects, including “Coats for Kids” in Unit 5 & District 87 schools, college scholarships for local high school students and efforts to eradicate Polio and Malaria, plus many more. We can deliver larger orders on December 7, or you can pick up your order from The Chateau on Saturday, December 8, from 10:00 AM-3:00 PM. To place an order, return mail order form by November 21, or contact any Normal Rotarian. Thank you to our generous community for their support of the Normal Rotary Club! 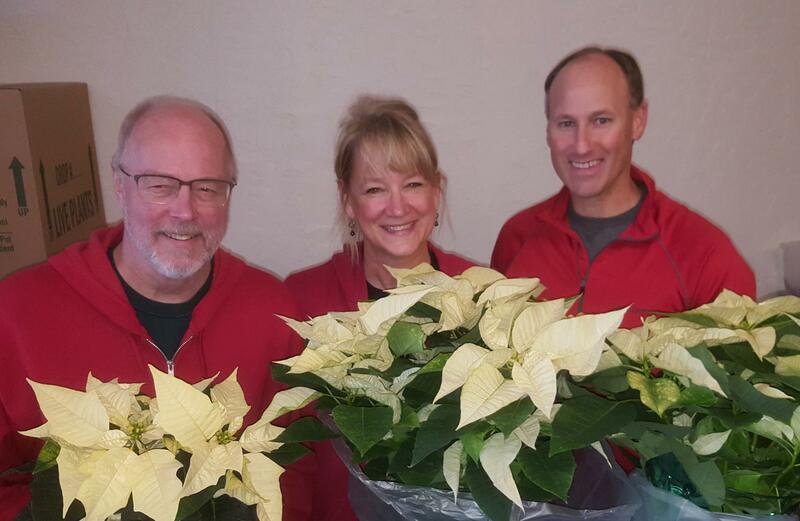 Normal Rotarians prepare poinsettias for pick-up.